Except for the Greens, most MEPs have backed going ahead with the negotiations on the so-called Transatlantic Investment and Trade Partnership (TTIP), but reiterated their concerns on a number of issues, especially cultural diversity. European Commissioner in charge of trade, Karel De Gucht, tried to quench some of the criticism, explaining that cultural diversity as enshrined in the EU Treaty and in the UNESCO Convention on cultural expressions was a guiding principle of the Commission’s actions, including trade. “Let me be crystal clear what our red lines will be: the EU and the member states measures in support of their audio-visual sector will be maintained and will not be subject to negotiations,” he said, acknowledging that the main challenge in the future to support Europe's audiovisual sector was to address the evolution of digital technology. This said, he insisted that excluding audiovisual services from EU commitments in the TTIP, as advocated by some MEPs, was neither necessary nor justified. The Commissioner added that he was deeply convinced that there were more workable solutions than fully excluding the audiovisual sector while still preserving those red lines. If agreed the TTIP could bring significant economic gains to the EU (€119 billion a year) and the United States (€95 billion a year). Combined, the US and EU economies – with a combined population of 813 million – account for 45% of the world’s gross domestic product and nearly 40% in terms of purchasing power. Reassuring that the Parliament favoured a comprehensive agreement to boost growth and jobs, centre-left MEP Bernd Lange noted that despite their similarities in many areas, the EU and the US had two fundamentally different social models. “On workers’ rights we have a culture of social dialogue, based on the ILO conventions. The system in the US is quite different,” he said. The Parliament’s resolution does highlight that achieving common standards is likely to present both technical and political challenges. "We are going to defend our social model and we are going to be very tough on this," S&D MEP Veronique De Keyser said. “No fundamental EU policy is up for being traded away!, “ answered De Gucht, referring also to other sensitive areas, such as agriculture, food safety, GMOs and data protection. Centre-right MEP and chair of the International Trade Committee, Vital Moreira, noted that in some areas the EU has little room for manoeuvre, but all issues have to be kept on the table. “Negotiations are all about give and take,” he said, stressing the European Parliament will be in the long run the one to give the green light to such a deal. Flagging the debacle of ACTA (Anti-Counterfeiting Trade Agreement), which was criticized for having been a deal negotiated without the full involvement of stakeholders, MEPs reiterated the need to be maintained in the talks’ loop. “We want to kept fully informed at all stages of the negotiations, before and after each negotiating round,” said Moreira. 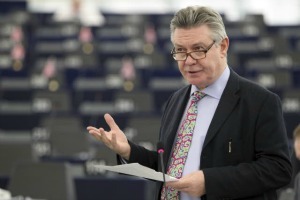 "We want much more transparency," insisted Green MEP Reinard Bütikofer, noting that the US Congress was better informed than the European Parliament. "Negotiations on a free trade agreement between the European Union and the United States should start as soon as possible, because a deal will bring huge benefits to both sides," Martin Schulz, president of the European Parliament, adding that standards adopted by the EU and US are likely to become a benchmark and should help strengthen the multilateral trading system. "In giving the go-ahead to EU-US free trade negotiations, a majority of MEPs have today kept their heads in the sand and ignored the myriad of major concerns with the Commission's requested mandate," said the Greens-European Free Alliance trade spokesperson Yannick Jadot. "The EU Commission is sadly simply guided by a dogmatic belief in trade liberalisation, with little regard for EU standards. Commissioner De Gucht himself has stated that everything is on the table. The result poses a real threat to core EU standards and rules, whether as regards the protection of the cultural sector and public services, intellectual property and data protection, food safety, GMOs, geographical indications, health and environmental standards...the risks are many. The US is much better organised in terms of economic and industrial policy and will have no qualms about defending its narrow interests," he added. MEP Godelieve Quisthoudt-Rowohl, EPP Group Rapporteur for trade relations with the US, said a reduction of customs and trade barriers on both sides of the Atlantic would be a "vitamin boost" for Europe's economy. Marietje Schaake (D66, Netherlands), ALDE spokesperson on trade said: "The perspective of facilitating economic growth and jobs, without needing to spend tax payer's money, is very good news. However, the road ahead will be challenging, and we need the involvement of citizens, SMEs and businesses to ensure this is a treatment for and by people. For that, trust in the negotiation process, as well as the involvement of stakeholders is essential." "A win-win agreement needs strong political support. We believe negotiations should not be pre-empted, and we should start without any red lines in the mandate. This parliament will play it's role in ensuring the negotiations serve the EU's interests," she added. Conservative MEP Robert Sturdy said a deal would not only boost exports in key sectors such as motor-manufacturing, but it would also It would also help secure a more outward looking EU that seeks access to foreign markets and does not resort to protectionism - a crucial plank of David Cameron's vision for a reformed Europe. "Slashing customs and trade barriers between Europe and the United States would be an economic growth programme for the world economy without any additional costs", said the international trade spokesman of the EPP Group in the European Parliament, Daniel Caspary (CDU) following today's vote by the European Parliament calling for a quick start to negotiations. "A free trade agreement would bring cheaper imports and create new jobs for Europe's exporting industry,"
Caspary warned against drawing lines before negotiations have even started: "We want to negotiate with the United States on a par, and in an atmosphere of mutual trust. Real friends such as Europe and the US are able to talk about difficult topics. This is just the beginning, where we must be able to speak openly about all topics for which the EU is responsible for". The American Chamber of Commerce to the European Union (AmCham EU) applauded the European Parliament resolution, saying the vote is a clear indication of the wide-based political will to conclude a TTIP. "It is important that the view points of the European Parliament are taken into account and the EU institutions need to work together to secure an agreement that will benefit business and citizens alike," stated Susan Danger, Managing Director AmCham EU. "Now, the Council needs to give the Commission a broad and flexible negotiating mandate to achieve this, she added. UK Government spokesman said: "We welcome the strong backing from MEPs for an EU-US trade deal. This is a once in a generation opportunity and that is why we are working hard to secure a launch of negotiations in time for the G8 summit in Lough Erne. We want to realise all the potential benefits of this deal for businesses and consumers. That's why we believe that we should put all sectors on the table at the start of negotiations." EU trade ministers on 18 April set an end-of-June deadline to reach an accord on the mandate to start negotiating a transatlantic trade and investment partnership that is strongly backed by EU leaders and US President Barack Obama. According to assessments made by the EU Commission and other European bodies, a comprehensive Trade and Investment Partnership could over time boost EU GDP by 0.5% annually and help create approximately 400,000 jobs in the EU. The Transatlantic Trade and Investment Partnership (TTIP) will extend beyond the removal of tariffs, to include the opening of markets on investment, services and public procurement. In addition, it will focus on aligning rules and technical product standards which currently form the most important barrier to transatlantic trade. Let us be very clear. These new trade pacts are NAFTA on Steroids. In the light of recent news (US murders own citizens with drones and murders unarmed citizens in their own apartment, plus US admits to war without aim and without end), the MEPs agreement could be re-phrased: “EU wants trade deal with war-mongering state that murders own citizens and provides historic support (= train soldiers to murder their own citizens) to genocidal regimes”. I suppose the next move by MEPs will be to conclude a trade deal with those other upholders of human rights – North Korea. One can see similarities between NK and the USA, at a trivial level both have slave camps although the USA calls theirs prisons (50% of the prison population black – vs 15% of the US population). In fairness (?) to the North Koreans they don’t discriminate on the basis of colour with respect to imprisonment. I did like the red-lines although needed a scanning electon microscope to see them – cultural diversity & I did check to see if today or yesterday was April 1st – sadly – not. US citizens (and indeed others) not liking the above are recommended to look at the news. None of the above are conjecture or hypotheses sadly they are facts. EUUS : Change treaty & Go ahead ! Can someone explain to me what “cultural diversity” means in practice?